Use the neuroscience of emotional learning to transform your teaching. How can the latest breakthroughs in the neuroscience of emotional learning transform the classroom? How can teachers use the principles and practices of positive psychology to ensure optimal 21st-century learning experiences for all children? Patty O’Grady answers those questions. 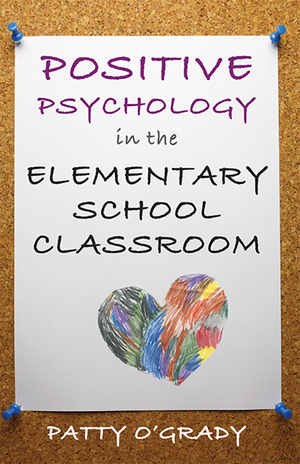 Positive Psychology in the Elementary School Classroom presents the basics of positive psychology to educators and provides interactive resources to enrich teachers’ proficiency when using positive psychology in the classroom. O’Grady underlines the importance of teaching the whole child: encouraging social awareness and positive relationships, fostering self-motivation, and emphasizing social and emotional learning. Through the use of positive psychology in the classroom, children can learn to be more emotionally aware of their own and others’ feelings, use their strengths to engage academically and socially, pursue meaningful lives, and accomplish their personal goals. The book begins with Martin Seligman’s positive psychology principles, and continues into an overview of affective learning, including its philosophical and psychological roots, from finding the “golden mean” of emotional regulation to finding a child’s potencies and “golden self.” O’Grady connects the core concepts of educational neuroscience to the principles of positive psychology, explaining how feelings permeate the brain, affecting children’s thoughts and actions; how insular neurons make us feel empathy and help us learn by observation; and how the frontal cortex is the hall monitor of the brain. The book is full of practical examples and interactive resources that invite every educator to create a positive psychology classroom, where children can flourish and reach their full potential.